In recent years, food insecurity has become an even greater issue of national concern in the United States. Currently, close to 50 million people in the U.S. do not have ready access to fresh, healthy and affordable food. Unfortunately, 16 million children (1 in 5) live in households where they are unable to consistently access enough nutritious food necessary for a healthy life. To help address food insecurity, which is an issue of national concern, Citi Cards has launched the Food on All Tables initiative as part of its Citi Table dining platform. Food on All Tables aims to increase food access and fresh sources of produce in the cities and communities where Citi does business. Through the Food on All Tables initiative, Citi Cards and the nonprofit Low Income Investment Fund (LIIF) are working with Alliance College-Ready Public Schools (Alliance) and the Los Angeles Conservation Corps to encourage healthy eating and active, healthy living for the school and neighborhood. 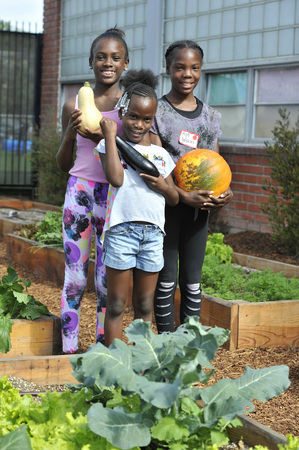 As part of this collaboration, we are excited to launch Citi GardensSM, a new 4,000-square-foot garden and athletic field at an Alliance College-Ready Public School in South Los Angeles, where nearly 94 percent of students qualify for reduced-price or free school lunches. Earlier this year, teachers, students and family members helped break ground, build and plant the garden. On October 25th, we gathered again to celebrate the grand opening of the garden with a Fall Festival. We were able to share the occasion of the garden's first harvest with some of the nation's leading urban revitalization organizations and other special guests. In addition to performances from students and a ribbon cutting ceremony, the Fall Festival also included garden tours led by students, cooking demonstrations and a health information table. Throughout the school year, the new garden and field will act as a hub for health, outdoor activity and learning. Students, their families and school faculty will have access to fresh produce, classes on cooking, gardening and nutrition, athletic activities and community events. In addition, teachers will turn the garden into an outdoor classroom space, giving students the opportunity for hands-on, experiential learning during their environmental science and biology lessons. The field will also serve as a place to play and exercise - building life-long healthy habits - and providing a new gathering spot for the community. Citi is proud to engage with local communities, cardmembers and employees to support this important cause. For more information please visit www.citi.com/cititable.